Come and ride with the Foundation for the Pure Spanish Horse, on the ever-popular French Way, or Camino Frances - a great and fun adventure. The trip is bursting with regional Spanish culture, historic cities and some of the greatest food available - from fine restaurant cuisine to hearty regional classics. ​The 9-day journey on horseback is steeped in a deeply spiritual history and the Camino de Santiago will truly change your life. Ven a cabalgar con la Fundación del Caballo Pura Raza Española, el por siempre y muy popular Camino Francés: una aventura genial y encantadora. El viaje está lleno de cultura regional española, ciudades históricas y algunos de la mejor gastronomía disponible, desde la excelente cocina de restaurantes hasta las abundantes comidas regionales. Este viaje de 9 días a caballo está lleno de historia y es profundamente espiritual, el Camino de Santiago verdaderamente puede cambiar tu vida. 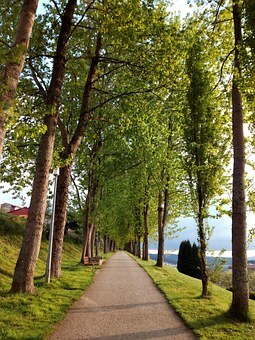 The Camino de Santiago is commonly referred to as the Way, or in Spanish the Camino. 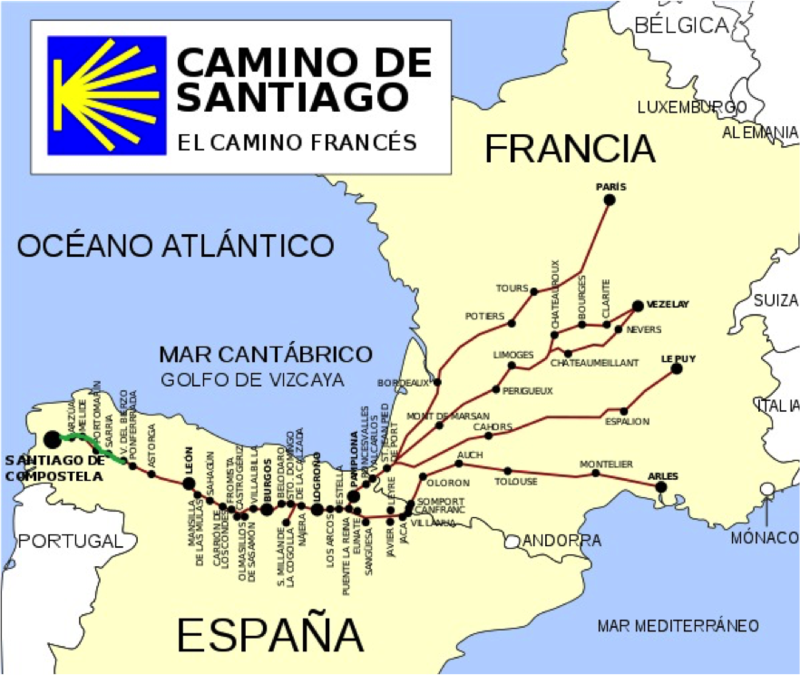 We will be taking The French Way, or the Camino Frances, which is the most desirable Camino route to Santiago de Compostela.The Camino Frances runs nearly 500 miles from St Jean Pied de Port on the France-Spain border to the Cathedral of Santiago de Compostela in northwestern Spain. We will ride the last section of the route, the fifth stage, which is 100 miles long. Beginning in O’Cebrerio, the journey winds through rural Spain and ends in the fabulous city of Santiago de Compostela. It is a wonderful section of the route and just enough mileage to gain your Certificate of Pilgrimage. This final stage passes through the sierra of Ranadoiro and descends into the valley to Triacastela. You pass through many hamlets dotted along cultivated land in the direction of the great river Mino to Portomarin. Pine groves and Eucalyptus trees can be seen as you enter the farming region of Ulloa. As you enter the province of A Coruna the landscape changes as the woodlands begin to disappear and you will soon see the spires of the Cathedral in Santiago de Compostela in front of you. The Camino de Santiago is a sea of legends and every night during dinner we will uncover the history of the places on the route, the tales, monuments, handicrafts and the gastronomy. At all times Hipica Amazonas, our tourist guide will have support vehicles available as well as any amenities you may require or desire. If you do not feel happy with your horse, it will be changed it so you can travel with maximum comfort. The personnel that accompany the trip will be at your entire disposal, both for transfers of suitcases as well as any question or need along the way. We hope to make your journey an unforgettable journey full of good times and memorable experiences. To start thinking about your next adventure, take a look through our Camino Route below. The green marker traces the route of our journey. The day-by-day itinerary is listed below the map. Day 1 - Our pilgrimage begins at the airport in Santiago de Compostela where you will be picked up and transported to the first hotel in O Cebreiro. From here we as pilgrims will start our journey, a great fun adventure on horseback. We will learn about the history of the Camino de Santiago, about O Cebreiro, its history, museums and culture, without leaving behind the gastronomy. In O Cebreiro we will have the first group dinner, tasting the local typical food, making a toast, and retiring early for the next day to begin our adventure!! Day 9 - May) The majestic entrance to the OBRADOIRO square .5 km. We will go through the old streets of Santiago Compostela until we reach the Plaza Do OBRADOIRO around 1pm. The price: the price is 3,250 Euros per person. (Does Not include airfare USA to Spain end destination Santiago de Compostela). We suggest fly to Madrid and then Santiago de Compostela. Most of Airlines going from USA to Madrid arrive in the morning, Iberia has several flights going to Santiago de Compostela in the afternoon. We will be waiting for you at the airport. The trip will end at Santiago de Compostela around 1pm April 7. This is the end of our journey. You can choose to stay in Santiago for one more night or fly to final destination. This hotel night is not included. This tour includes: hotels, breakfasts, lunches and dinners at the site. There would be 8 hotel nights, 8 dinners, 7 lunches, 8 breakfasts and all the horses, with staff. Reservation for the trip: There is a deposit of 500 Euros or the equivalent in USA dollars at the moment of the reservation, payable to the Foundation for the Pure Spanish Horses. Dates: The Trip is scheduled. (Maximum 12 persons, minimum 6 persons per group) April 29 to May 7, 2019. Friends that do not ride can come along the way in a provided car, or can walk the path too, please ask for the price if there is interest. The Accommodations: The first two nights we will be lodged in County Houses (houses of rural tourism). These are typical Spanish structures that have been restored. As we approach larger towns, we will lodge in hotels. All are located in most central area of the towns, so you can easily explore the local flavor and historic places. The Hotels are very comfortable, quality establishments and the Country Houses have a unique presence. The rooms can be shared or can be single use, for single use will be an extra charge of € 30 per night. The horses: Your horses are chosen for their very calm natures and fine dispositions. They are accustomed to walks and working together. Generally all the horses have been proven child safe. We treat our horses well. As an integral part of the mission trip, they will receive their usual diet, as well as supplemental vitamins and amino acids adapted to the working conditions. They receive three daily meals as well as the forage during the night and moments of their rest. English saddles are used as the horses are used to them and they are lighter weight for long journeys. (Spanish saddles are available if required, however, our recommendation is the use of the English saddles for your comfort. They are also light and easier to clean daily on the road). A truck and a van will accompany us all the way, providing additional horses, if necessary. These vehicles will transport the tack, luggage and other personal belongings. Gastronomy: The Camino Frances (the French Way) is known as the path of good cuisine and great wines! Our lunches and dinners are taken at wonderful restaurants. Here you will experience the best of the typical foods and wines of the area. Selection is broad and those who have special dietary needs should find ample choices for breakfasts, lunches and dinners. The staff: Hipica Amazonas has years of experience with horses, they organize events, provide clinics, they are an approved center by the Spanish Horse Federation, they advise breeding farms in Spain and outside Spain, they teach horse riding classes at all levels, camps organization, training room, school visit center with groups of more than a hundred children, preparation and presentation of P.R.E. Horses at international level shows. All the staff is specialized, qualified and experienced. Additional Outings: In addition to visiting the beautiful towns along our journey. We will visit a saddlery factory where the saddles for the famous Spanish Rejoneador (bull fighter on horse) Pablo Hermosa de Mendoza are made. Also we will visit a cheese factory, since cheese is one of the gastronomic specialties of the area. El Camino de Santiago se conoce comúnmente como el Camino, Tomaremos el Camino Francés, que es la ruta más deseable del Camino a Santiago de Compostela. El Camino Francés se extiende por casi 500 millas (800 Km) desde St Jean Pied de Port en la frontera Francia-España hasta la Catedral de Santiago de Compostela en el noroeste de España. Cabalgaremos la última sección de la ruta, la quinta etapa, que tiene 100 millas (160 km) de largo Comenzando en O'Cebrerio, el viaje serpentea por la España rural y termina en la fabulosa ciudad de Santiago de Compostela. Es una sección maravillosa de la ruta y el kilometraje suficiente para obtener su Certificado de peregrinación. Esta etapa final pasa por la sierra de Ranadoiro y desciende por el valle hasta Triacastela. Atraviesa muchas aldeas diseminadas a lo largo de tierras de cultivo en dirección al gran río Mino rumbo a Portomarin. Los pinares y eucaliptos se pueden ver al entrar en la región agrícola de Ulloa. Al entrar en la provincia de A Coruña, el paisaje cambia a medida que los bosques comienzan a desaparecer y pronto verás frente a tus ojos las agujas de la Catedral de Santiago de Compostela. El Camino de Santiago es un mar de leyendas y todas las noches durante la cena descubriremos la historia de los lugares en la ruta, los cuentos, los monumentos, las artesanías y la gastronomía. En todo momento Hípica Amazonas, nuestra guía turística, nos brindara el mejor apoyo posible , cuenta con vehículos disponibles que acompañan el grupo a lo largo del camino, así como con todas las comodidades que pueda necesitar o desear. Si no se siente feliz con su caballo, se lo cambiará para que pueda viajar con la máxima comodidad. El personal que acompaña el viaje estará a su entera disposición, tanto para las transferencias de maletas como para cualquier pregunta o necesidad en el ruta. Esperamos hacer de su viaje un viaje inolvidable lleno de buenos momentos y experiencias memorables. Para comenzar a pensar en su próxima aventura, eche un vistazo a nuestra ruta Camino a continuación. El marcador verde traza la ruta de nuestro viaje. El itinerario día a día se enumera en la debajo del mapa. Día 1 - (29 de abril) Nuestra peregrinación comienza en el aeropuerto de Santiago de Compostela, donde somos recogidos y transportados al primer hotel en O Cebreiro. Desde aquí, como peregrinos comenzaremos nuestro viaje, una gran aventura divertida a caballo. Aprenderemos sobre la historia del Camino de Santiago,sobre O Cebreiro, su historia, museos y cultura, sin dejar de lado la gastronomía. En O Cebreiro tendremos la primera cena grupal, degustando la comida típica de la zona, haciendo un brindis y retirándonos temprano para el próximo día para comenzar nuestro viaje. Almuerzo en el Km 10.2 Km en Samos. Almuerzo en el km 13.3 en A Brea/O Pino. Día 9 - (La majestuosa entrada a la plaza OBRADOIRO total 5 km. 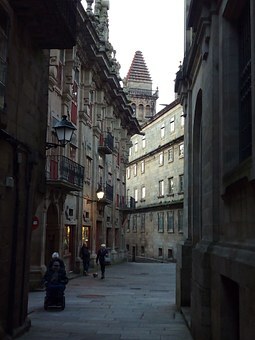 Pasaremos por las antiguas calles de Santiago Compostela hasta llegar a la Plaza Do OBRADOIRO. El precio: el precio es de 3.250 euros por persona. (No incluye el pasaje aéreo a España con destino final Santiago de Compostela, ni la última noche de Hotel en Santiago de Compostela, Pero la misma puede ser reservada por la FPSH). Que incluye: todos los hoteles, desayunos, almuerzos y cenas. Habrá 8 noches de hotel, 8 cenas, 7 almuerzos, 8 desayunos y todos los caballos, con personal. Desde la noche del 29 de Abril al día 7 de Mayo. Reserva para el viaje: Un depósito de 500 euros o su equivalente en dólares estadounidenses en el momento de hacer la reserva, pagados a la FPSH. Fundation for the Pure Spanish Horse. Si tienes un amigo que no monta a caballo, puede caminar trazos o tiene la opción de acompañarnos en auto. Pregunta por el precio si tienes interés. Fechas: El viajes esta programado. (Grupos con un Máximo de 12 personas, mínimo 6 personas) para estas fechas. Sugerios llegar por avión a Santiago de Compostela, casi todas las aerolíneas de America a Epana, llegan por la mañana, Iberia tiene salidas a Santiago de Compostela por la tarde, donde seremos recogidos. Eso indica que debemos volar el día 28 de Abril para llegar en la fecha indicada el día 29 de Abril. Los alojamientos: Las primeras dos noches nos alojaremos en casas del condado (casas de turismo rural). Estas son estructuras típicas españolas que han sido restauradas. A medida que nos acercamos a ciudades más grandes, nos alojaremos en hoteles. Todos están ubicados en la zona más céntrica de las ciudades, para poder caminar y explorar fácilmente el sabor local y los lugares históricos. Los hoteles son muy confortables, los establecimientos de calidad y las Casas de campo tienen una presencia única. Las habitaciones se pueden compartir o pueden ser de uso único, para un solo uso será un cargo extra de 30 € por noche. Los caballos: Los caballos que se utilizan son elegidos por su naturaleza tranquila y sus buenas disposiciones. Están acostumbrados a caminar y trabajar junto y hermanados. En general, todos los caballos han demostrado ser seguros inclusive para niños. Tratamos muy bien a nuestros caballos por ser la parte integral del viaje y la misión, ellos recibirán su dieta habitual, así como vitaminas y aminoácidos suplementarios adaptados a las condiciones de trabajo. Reciben tres comidas diarias así como también el forraje durante la noche y los momentos de descanso. Las monturas que se usan son inglesas porque los caballos están acostumbrados a ellas y son más livianas para viajes largos. (Sillas de montar españolas están disponibles si es necesario, sin embargo, nuestra recomendación es el uso de las sillas de montar inglesas para su comodidad. También son livianas y fáciles delimpiar a diario en la carretera). Un camión y una furgoneta nos acompañarán durante todo el trayecto, proporcionando caballos adicionales, si es necesario. Estos vehículos transportarán la guarnicionería, alimentación de caballos, nuestro equipaje y otras pertenencias personales. Gastronomía: ¡El Camino Francés es conocido como el camino de la buena cocina y los grandes vinos! Nuestros almuerzos y cenas se toman en restaurantes maravillosos. Aquí podrá experimentar lo mejor de los alimentos y vinos típicos de la zona. La selección es amplia y aquellos que tienen necesidades dietéticas especiales pueden encontrar amplias opciones para desayunos, almuerzos y cenas. El personal: Hipica Amazonas tiene años de experiencia con caballos, organizan eventos, ofrecen clínicas, son un centro aprobado por la Federación Española de Caballos, aconsejan criaderos en España y fuera de España, imparten clases de equitación en todos los niveles, campamentos organización, sala de capacitación, centro de visitas escolares con grupos de más de cien niños, preparan y presentan caballos P.R.E. a nivel internacional. Todo el personal es especializado, calificado y experimentado. Paseos adicionales: Además de visitar las hermosas ciudades a lo largo de nuestro viaje. Visitaremos una fábrica de guarnicionería donde se hacen las sillas de montar para el famoso rejoneador español Pablo Hermosa de Mendoza. También visitaremos una fábrica de quesos, ya que el queso es una de las especialidades gastronómicas de la zona.